This is a guest post by Future of Research policy activist, Adriana Bankston. This blog is a shorter version of the poster presented by Future of Research at the 2017 AAAS meeting and the 2017 NPA meeting, with additional comments and ideas. 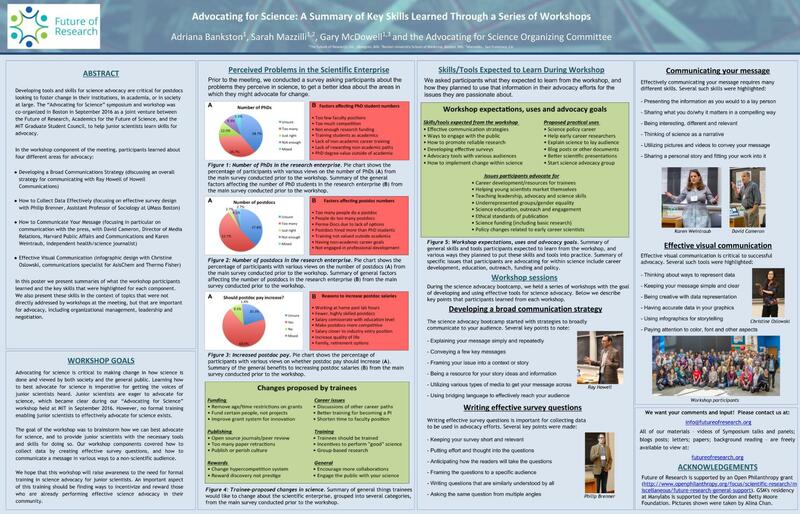 The poster is entitled “Advocating for science: a summary of key skills learned through a series of workshops.” The goal of the poster was to summarize our meeting on “Advocating for Science” symposium and workshop, which was co-organized in Boston in September 2016 as a joint venture between the Future of Research, Academics for the Future of Science, and the MIT Graduate Student Council, to help junior scientists learn skills for advocacy. We hope this information in the form of a blog post will be useful to trainees who want to advocate for science, especially following the March for Science events. Advocating for science is critical to making change in how science is done and viewed by both society and the general public. Learning how to best advocate for science is imperative for getting the voices of junior scientists heard. Junior scientists are eager to advocate for science, which became clear during our “Advocating for Science” workshop held at MIT in September 2016. However, no formal training enabling junior scientists to effectively advocate for science exists. The goal of the workshop was to brainstorm how we can best advocate for science, and to provide junior scientists with the necessary tools and skills for doing so. Our workshop components covered how to collect data by creating effective survey questions, and how to communicate a message in various ways to a non-scientific audience. We hope that this workshop will raise awareness to the need for formal training in science advocacy for junior scientists. An important aspect of this training should be finding ways to incentivize and reward those who are already performing effective science advocacy in their community. Are there too many PhDs? Interestingly, the majority of the answers were yes (34.7%) and unsure (38.7%), but these percentages are not terribly high. When asked about the factors affecting PhD student numbers, the most common answers had to do with the number of faculty positions, the amount of research funding, the question of training students as academics and the value of their PhD degree outside of academia. Are there too many postdocs? In this case, more than half of participants (52.7%) said yes, and still a pretty high percentage (37.8%) were unsure. The factors they listed as affecting postdoc numbers were the number of people doing a postdoc, the idea that people are doing too many postdocs, and the issue of Perma-Docs. Additional ideas were the lack of postdoc engagement in professional development activities, and the issue of postdoc training not being valued outside of academia. Should postdoc pay increase? As expected, most participants (68.9%) said yes and some (20.3%) were unsure. Reasons for this revolved around postdocs continuing to work at home past their lab hours, salary not being commensurate with their education level, as well as the ability to increase quality of life and retirement options. Participants also noted that paying postdocs more may result in fewer, highly skilled postdocs who may ultimately be more competitive. While these data are informative, the fact that quite a high percentage of participants are still unsure about the number of PhDs/postdocs or whether postdoc pay should increase signifies that more discussions are necessary to understand what trainees are going through and how we can help them. Please see the poster for a complete dataset and more information on these points. Interestingly, these answers, while fairly broad, collectively appear to cover pretty much every area of science that we might think of in terms of things that need changing. This means that we should be working on all of these aspects of the scientific enterprise in order to be able to help current trainees succeed in their goals. Skills/tools expected from the workshop: These were, as expected, communication strategies and tools to engage with various audiences, as well as other ways to engage with the public and promote reliable research. Proposed practical uses: Some of these included explaining their science to a lay audience, as well as improving their presentation skills and perfecting other ways of communication (such as blog posts and other types of documents). Other answers were more actionable in terms of starting a science advocacy group, and/or using this information to boost their own science policy careers. Finally, using these skills to help ECRs was another proposed direction. Issues participants advocate for: These mirrored a lot of the same issues which trainees wanted to fix in science (from the previous section). Some of these as we might expect, were science funding and career development. Within science, other points were ethical standards of publication and policy changes to benefit ECRs. Trainees also advocate for other types of training (such as leadership and advocacy) and recognition of their involvement in outside activities (such as science outreach and public engagement). Overall, these answers seemed to range around the general theme of trainees wanting to improve their own skills of science communication, and using these skills to then address various audiences. They also planned to use their newly learned skills to advocate for change in specific issues in science within their communities. Please see the poster for more details on these points. Since these sections are the major highlight of the poster, and were already fairly well described, they are just copied them in this post directly from the poster. During the science advocacy bootcamp, we held a series of workshops with the goal of developing and using effective tools for science advocacy. Below we describe key points that participants learned from each workshop. In conclusion, trainees need many different skills and tools to advocate for specific issues in science and be able to address various audiences, including policymakers and the general public. 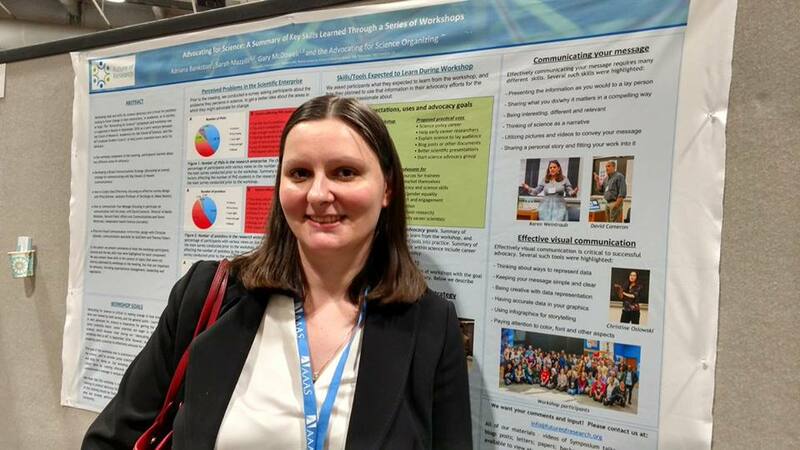 The information in this blog post (and in the poster) clearly shows the need for providing this type of training to junior scientists, and we are hopeful that these insights will serve as useful guidelines for developing this type of training across U.S. universities. – How do we combat the culture that postdocs want to always be in the lab and not out advocating for science? – Is a good scientist always a good communicator? – How important is reaching out to various audiences? – How do you foster excitement for trainees to get involved in advocacy? Have insights into these questions? We want to hear from you!